LuAnn Lantsberger is a Coordinator for the EDCOE Personnel Services Department and helped organize the event. “I’m glad the event was such a success and connected our programs and school districts with promising potential candidates,” she stated. “We really appreciate our partnership with Brandman and thank everyone on our Personnel Services team for their contributions to the event,” Coleen Johnson, Executive Director of Personnel Services, noted. 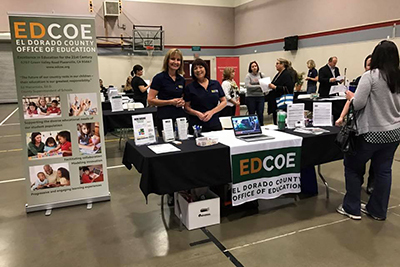 El Dorado County is a destination for education and a wonderful place to work. Many open positions are available and include teachers - elementary, secondary, substitute; special education - teachers, aides; State Preschool/Head Start - teachers, aides; school psychologist; school nurse; van/bus drivers; food service; office administration; language, speech and hearing specialists, and much more.